Dungeons takes a different spin on the dungeon strategy management genre which makes for a unique experience where you’ll invite heroes into your dungeon, provide them with a tantalising adventure and drain their souls before they can escape. 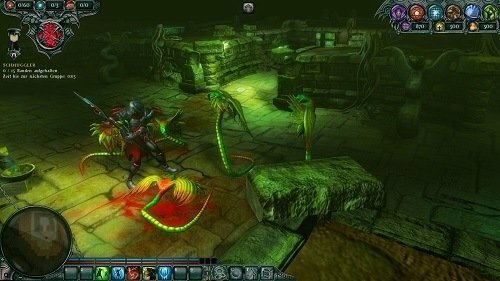 The game was released in 2011 published by Kalypso Media who would go on to support Dungeons 2 and Dungeons 3 albeit with different game mechanics. In Dungeons players take control of a once dominate Dungeon Lord who falls victim to a disastrous plot headed by his ex-girlfriend to rip away his power. In order to regain your power you will have to start from the bottom and work your way through 17 single player missions to reclaim your power one goodly hero soul extraction at a time. This includes 3 separate bosses with their own mechanics to overcome along the way and help to break up the core gameplay of hero attracting. Dungeons separates itself from the usual dungeon management affair by focusing your attention towards caring for heroes rather than your own evil minions. This ties into the primary game mechanic which requires you to satisfy heroes with treasury or easy enemies. Once satisfied these heroes will be full of juicy and vital soul energy for harvesting either by commanding your Dungeon Lord to dispatch them or calling open your traps before they can escape your dungeon. Your Dungeon Lord avatar is also able to drag heroes into the prison as part of your Dungeon strategy. This vital soul energy fuels the upgrade cycle of your dungeon by allowing new rooms to be built, equipment purchased and traps to overall better satisfy heroes and dispatch them. Because of this gameplay players focus on creating the ultimate dungeon lair that entices heroes to their death in order to fuel your dungeon with soul energy for expansion. You can achieve this by using the hundreds of items and by summoning over a dozen monster types to roam your dungeon. Depending on the items you place around your dungeon you will attract ten different heroes with varying desires to satisfy. The individual game levels have a decent level of variety and just the right campaign length before it all gets too repetitive although each does require a fair amount of micromanagement to achieve the most efficient victory. For those gamers that want more when they’re finished with the campaign there is a sandbox mode that offers more hero farming adventure. If you go into Dungeons knowing that the game is a different experience to the usual dungeon lord game (and not expecting Dungeon Keeper 3) you’ll thoroughly enjoy enticing heroes into your domain only to imprison them for their soul energy. Entice heroes into your dungeon for soul energy to fuel your dark crusade. Huge collection of items to put into your dungeon alongside rooms and traps. Attract in 10 hero varieties that each have their own desires from your dungeon. Dark storyline with a twisted sense of humour. Good campaign length with a sandbox mode also included. This one of the worst strategy games I ever played. Read the reviews on Steam before buying !! !